Heat oven to 350°F. Spray bottom of 13x9-inch pan with cooking spray. In pan, mix peaches, sugar and cinnamon. Spread evenly. Top with dry cake mix, and gently shake pan to distribute evenly. Pour melted butter over top, tilting pan to cover as much of the top with butter as possible. Bake 42 to 45 minutes or until light golden brown, mostly dry on top and bubbly around edges. Cool 20 minutes before serving. In small microwavable bowl, microwave frosting uncovered on High 5 to 10 seconds or until thin enough to drizzle. With fork, drizzle on top of cake. Serve with whipped topping or vanilla ice cream, if desired. Dump cakes are sometimes difficult to determine doneness. It’s normal to see some wet spots, some dry cake mix and a crisp-like texture on top. Be sure fruit mixture is bubbly around edges of pan. 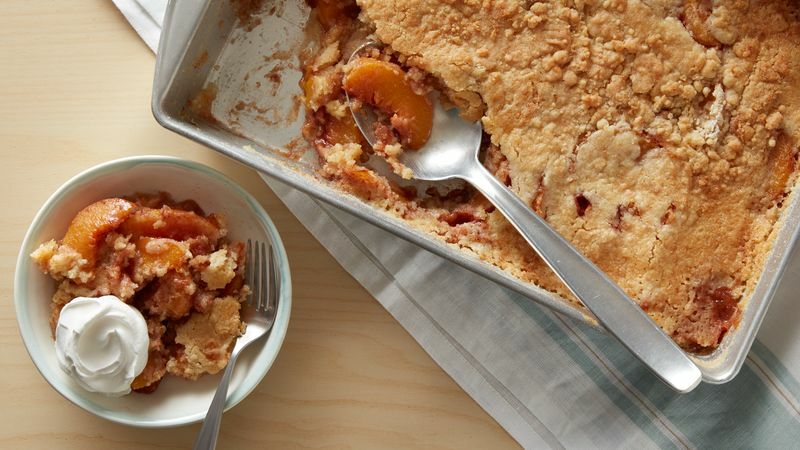 Serve this with vanilla ice cream or whipped cream for the whole peaches and cream experience.